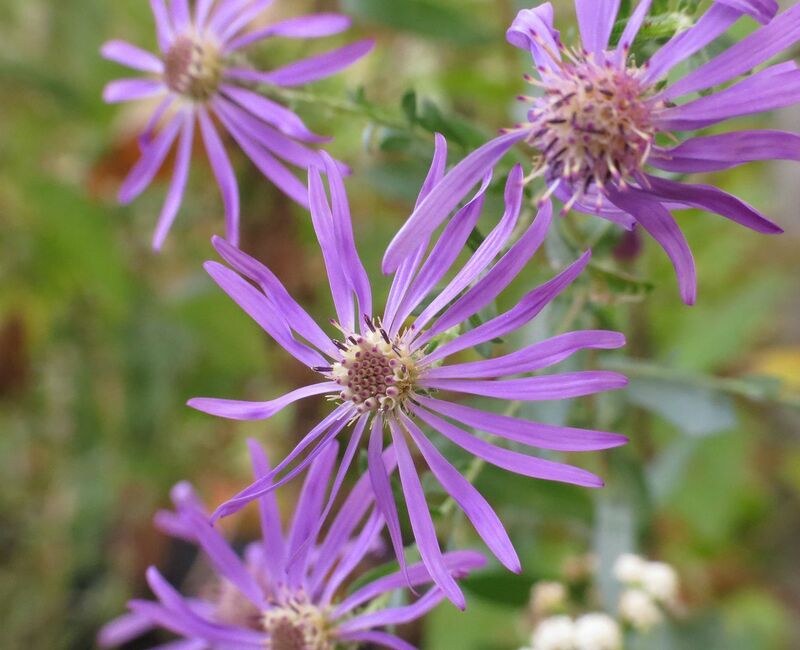 Symphyotrichum georgianum, is easily one of the latest flowering perennials in the temperate US. Both a failing and a highlight of this species is that they start blooming right after the trees have dropped a lot of their leaves. Goldenrod and other Asters are all usually past the half way mark in their bloom by the time this species even starts to flower. So a lot of the plant be beneath a pile of leaves leaving mostly just the flowers poking up among the fall color. This is also an endangered species in the wild but nurseries are easily able to propagate it by seeds and cuttings, as I intend to do with the few plants I have in my yard. The flowers themselves are a bit on the scraggly side but the overall size as well as the individually long florets in each flower disk makes them quite attractive. As far as ecological benefits go, you're probably not missing much by having this species in your garden. While they are restricted to a few populations in the state of Georgia, the species is hardy from zones 5 to 9. 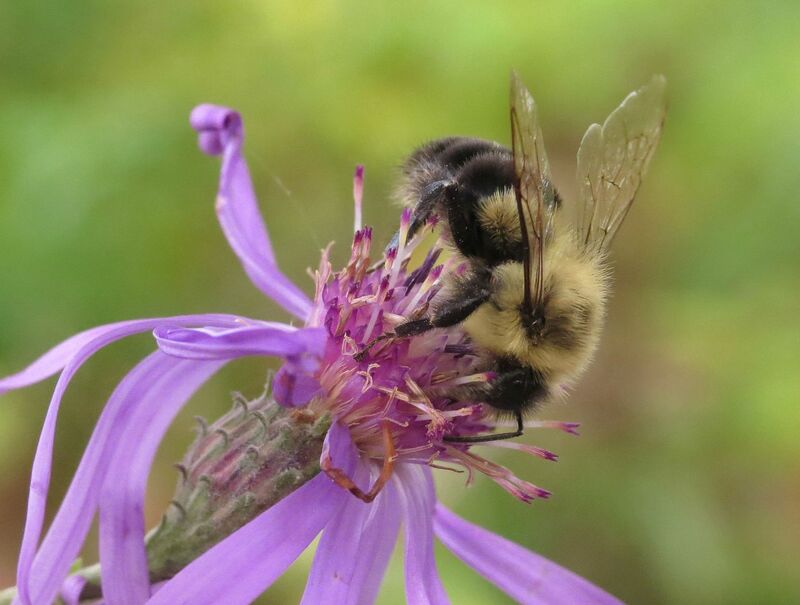 The plants in my yard are really just prolonging the the lives of a few male bumblebees another week or two. 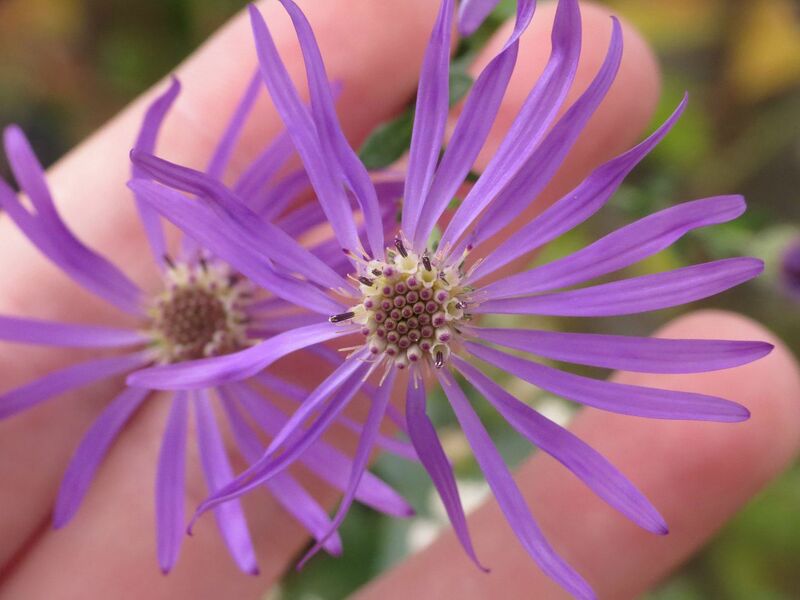 Older specimens can be quite floriferous, turning more bush-like, similar to but not quite like Aromatic Aster, Symphyotrichum oblongifolium. If you're going for a low bushy boarder of flowers though you should probably just plant S. oblongifolium, and really unless you have a nice population of New England Asters going, there isn't much reason to plant Georgia Aster. Everything that is going to over winter is pretty well fed already. But if you're still looking for something that flowers this late in the year then by all means give S. georgianum a try. Well the Red Spotted Purple emerged, Limenitis arthemis. And it's bizarrely small, maybe 3 inches wide at most. 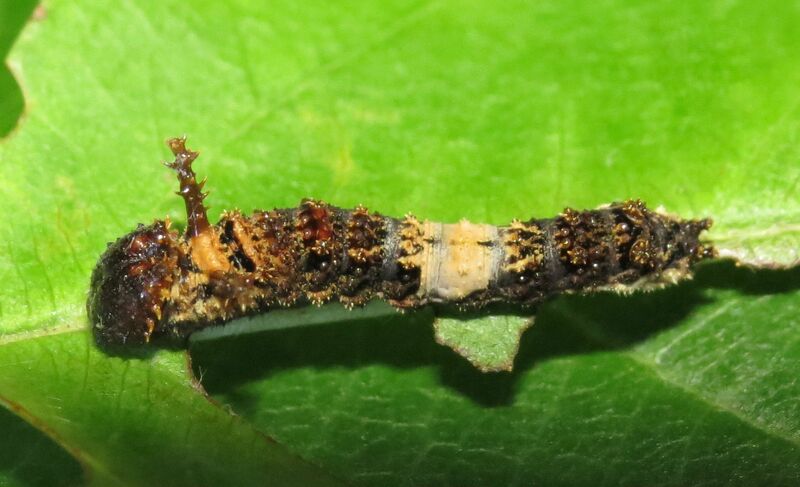 I've heard of small generations of other Lepidoptera being born but it was always attributed to poor leaf quality, occasionally species having to eat leaves that had already fallen off of trees. I don't think that's what happened here. 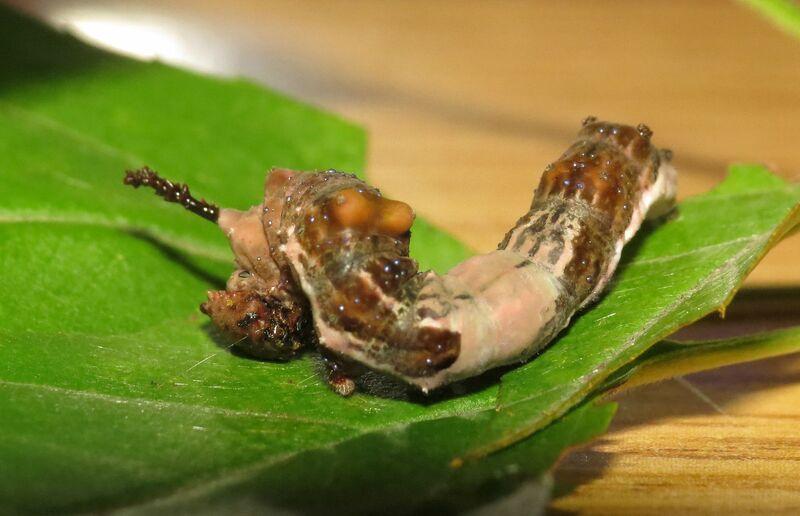 In the last two instars I was picking leaves fresh off the tree in groups of four to seven and the caterpillar consumed them all in one sitting. My only thought on this is either it's somehow beneficial to be smaller than typical during the winter months (when these dwarf versions tend to occur) and must be somehow triggered by either chemicals in the tree leaves it consumed and/or hours in the day. I did notice the White Snowdrift Crabapple retained its leaves, and still has them on the tree even now, where as the native American Plum, Beach Plum and Black Cherry have all already dropped their leaves. It also had ripening fruit on it, so maybe it's just a result of hosting on Apples instead of Plums at this time of year. (They can use both). I'm going to try and keep this one in captivity. We're well past the time to let them go for the year, and outside the only thing blooming is Goldenrod and Georgia Asters. The species does not migrate south and they do not over winter as adults, so there's zero chance of it surviving beyond a week. My intent is to keep this one as a specimen. 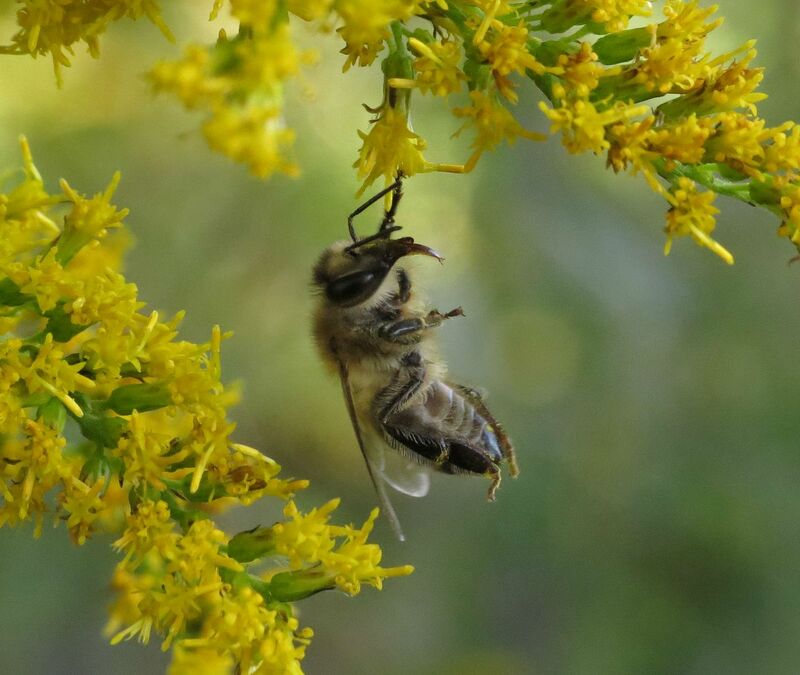 I got a picture of a honeybee having an awkward moment. Without explanation this bee clearly looks poisoned or diseased, but really though it was perfectly fine and I watched it working droves of flowers in my patch of Tall Goldenrod, Solidago altissima. It was a cool day though and in the shade I just so happen to get the perfect shot as she decided to roll off of the flower instead of make a perfect take off as she'd done hundreds of times before. I actually moved the patch of Solidago altissima to a dryer part of my yard. It's actually much better behaved there, spreading slowly instead of each cane producing seven more the following year, and growing only 5' tall instead of 13'. I'll still need to thin it out but probably only once every five years instead of every other. Seaside Goldenrod, Solidago sempervirens, is also flowering. And I realized what it is that I love about this species. It has petals! And you can clearly see them, whereas the common Goldenrod species all have small petals that are so scraggly they almost blend in with the anthers. Pictured above it's a day or two past its prime but you can still make out what I mean with the most recently opened blooms at the top. They remind me of Golden Ragwort, and in fact if you google this species you'll see a picture of Golden Ragwort actually comes up. One thing I don't like about the plant is their habit of falling over. Each plant produces a series of stems that all grow too long and flop over under the weight of their own flower buds. You can see the one above arching over a branch to one of my Beach Plums. 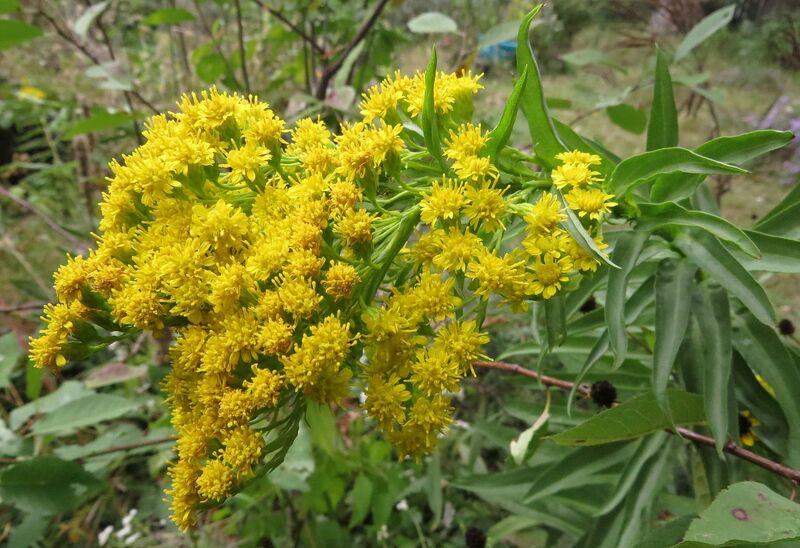 Seaside Goldenrod is a new species to my yard. I have a few of them planted in the sand patch I made, along with the Beach Plum. Hopefully they survive the winter. Where I live in New Jersey I'm closer to Pennsylvania than the Jersey Shore or Pine Barrens, so I'm well inland on a plot that's almost entirely clay. This species grows happily in 100% sand at the beach and does not occur naturally anywhere away from the coast or adjacent bays. Beach Plum also occurs here and did survive in my yard from last winter so hopefully these plants will too. I have one planted in the meadow garden where the soil is almost entirely clay. Actually it's neat digging in the meadow now because I see the 7 or so years of decomposing organic matter there is slowly turning the soil more loose and loamy. 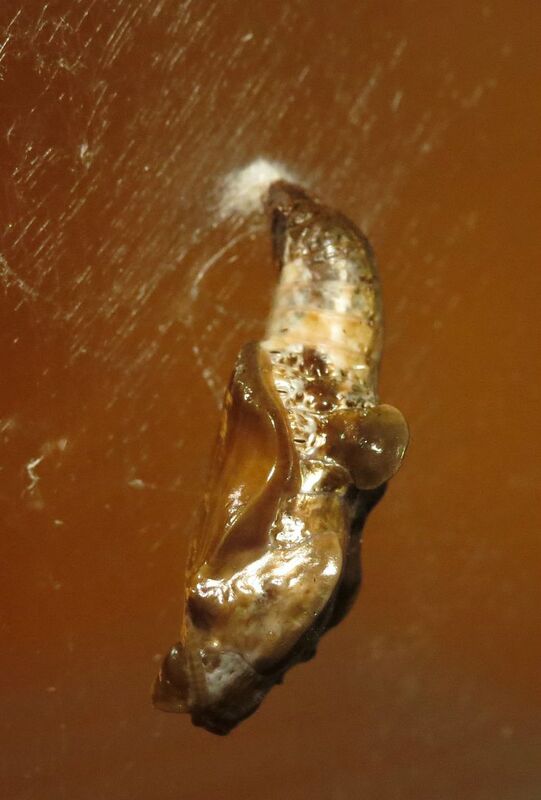 So I noticed the caterpillar seemed to make an abrupt jump in its development. I made an assumption that as long as the apple tree I found it on had leaves, then this caterpillar would happily eat them. What I forgot though was the average temperature and amount of day light were also factors. Posing the question of when I should put this one in the fridge to over winter, I learned I should have done that a week ago when it was in the third instar. Apparently that is the instar that they go into hibernation. Unlike species who spend winter in the chrysalis stage, the number of hours in the day when the sun is shining as well as the temperature determine whether or not they should hibernate or move on to further instars and adulthood. Tragically my caterpillar is well into its 5th instar and I'm told nothing will stop it now from developing into a chrysalis and emerge into an adult 7 to 10 days later. This species does not migrate and by then it will be late October or early November, when it is too cold to release, and the host tree (a White Snowdrift Crabapple) will likely have lost all its leaves. I suppose I will have to let it happen and keep the butterfly captive until it expires. I'll try and keep it alive by offering it pieces of rotting fruit, and eventually pin it I guess. Speaking to its host plant for a moment. The little crabapples have turned orange and the birds are already eagerly pecking away at them. Lots of the leaves are now covered in damaged fruits as well a surprising amount of bird droppings. 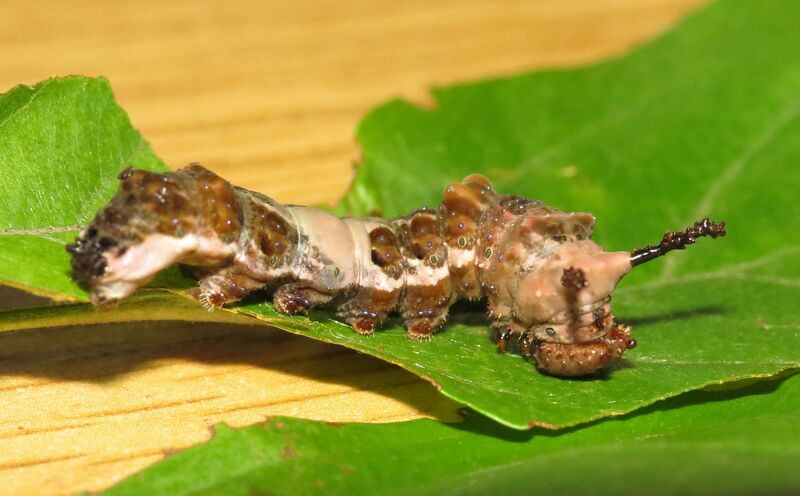 I wonder if actually having real bird crap around makes the disguise this caterpillar produces more or less convincing. 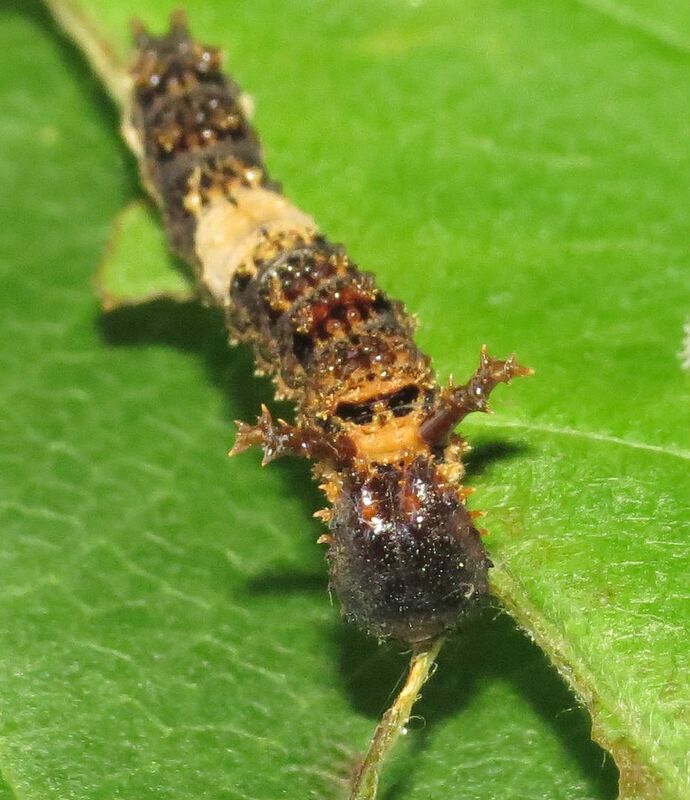 There are likely two or tree more Red Spotted Purple caterpillars on the tree, but as they're likely just in their third instar, I'll have to wait until the leaves fall off of the tree to look for them. My understanding is the "shed" they make by rolling a leaf around them with silk does not fall off of the host plant. If I find a few, I'll be sure to collect and store in my fridge until the tree leafs out and flowers the next year. 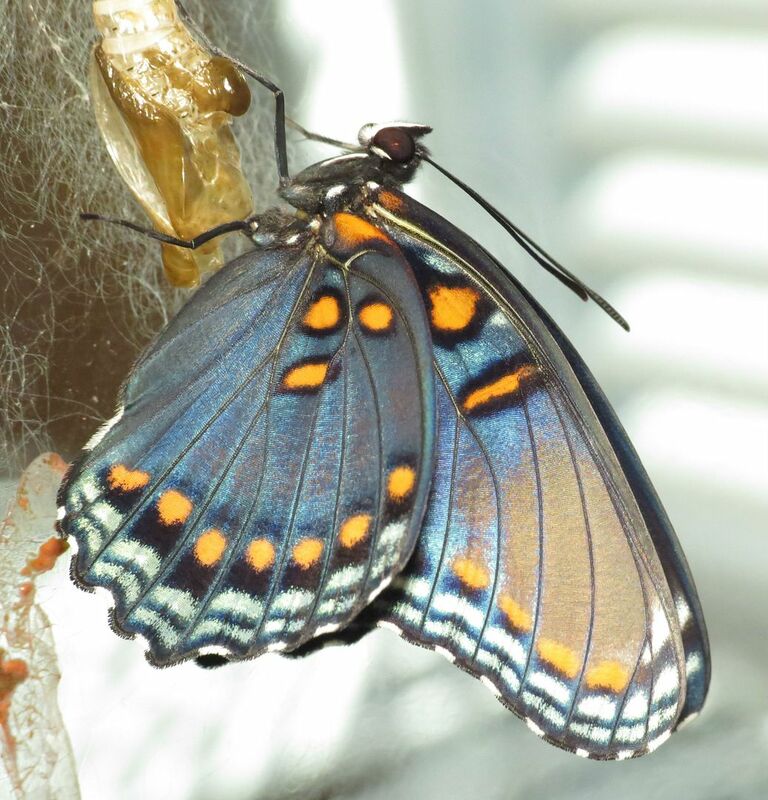 The Red Spotted Purple, Limenitis arthemis, that I have in captivity has grown a bit since I last bothered to look at its container. It's been nibbling the same leaf in there for quite a few days now. I add a free leaf off the crab-apple tree its egg was laid upon ever few days. I also put a wadded up tissue that's soaking wet with water in the container so it doesn't dry out, though I'm not sure how necessary this is. I know ants are in danger of drying out so perhaps caterpillars have the same risk? We're now in what I believe to be the third instar. 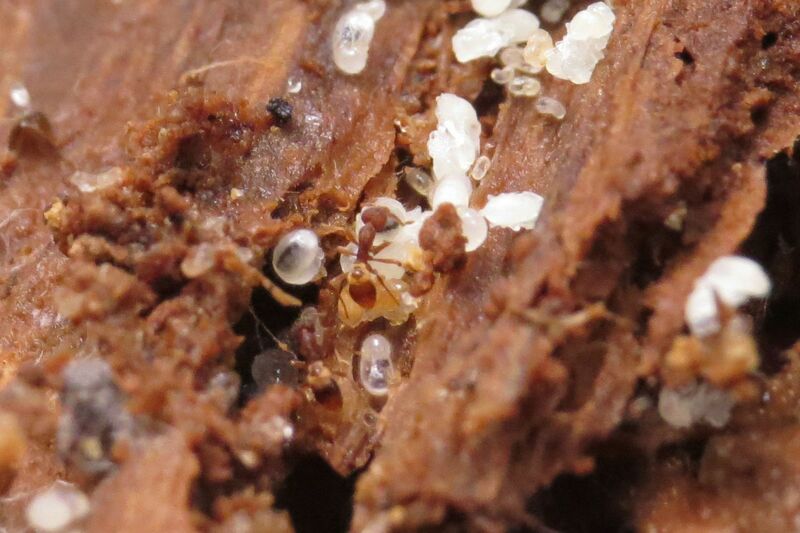 It's no longer making a stick out of frass to hide on, which the younger instars do to escape ants. Instead more natural defenses are starting to develop. I suspect from here on, birds would be the primary predator over ants. Their coloration is starting to mimic that of bird droppings. So they've gone from hanging out on a poop stick, to looking like one! And of course it's now sporting a lovely set of jagged horns. My understanding is the horns are hollow and intended to break apart in the bird's throat to, ideally, puncture a hole in the crop or wind pipe killing the bird dead. This probably doesn't happen when they're this small, but I can easily see some damage being done when they're bigger. Birds don't have teeth to chew them up first. Strumigenys is a diverse genus in North America with almost 50 species. 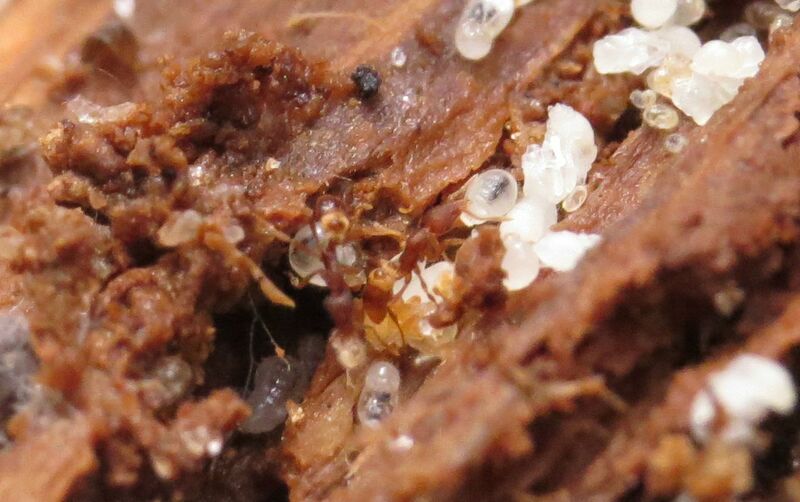 Despite this diversity though, the genus is almost exclusively encountered by Myrmecologiests and those in other scientific fields that involve sifting through leaf litter and dead wood. They're so small that they're hardly noticeable, and they look so strange compared to other ants that most people would likely be confused that they were even looking at an ant. 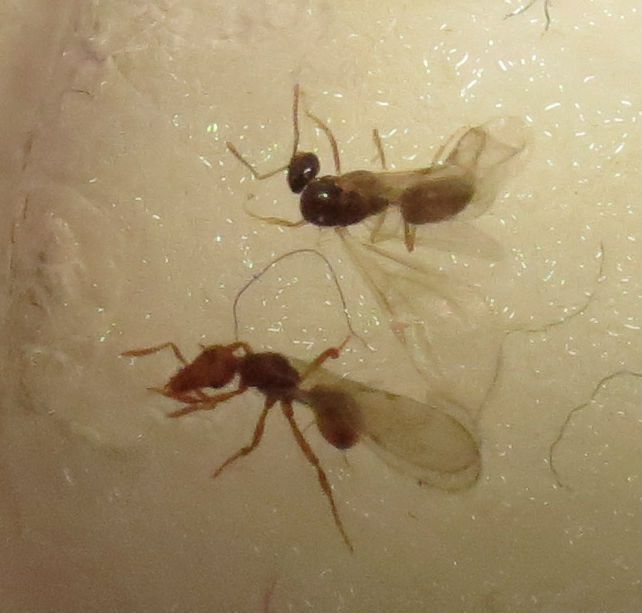 For better close ups, here's a link to Ant Web's specimens, and Alex Wild's album of the genus. Notice the odd petal-like structures that cover the body. These are modified hairs which I believe are used help cloak the ants as they hunt. Some species in the genus have long mandibles similar to a Trap Jaw ant's. These are used to allow oils (and fungi?) which make the ant less noticeable while hunting. They're primarily predators of springtails which are small, mite or termite-looking insects often found in decaying wood. Truthfully though these ants are more than happy to kill any sort of soft bodied invertebrate. These ants require "cool" conditions in order to survive. In the wild they always nest inside the damp and decaying media within the hollow of a tree, or in a soggy log that's often well shaded and rotting. Other species are at home nesting in soil and leaf litter, but good luck finding those. Colonies do not make mounds of any kind, entrance holes are often cryptic at best, and populations tend to range around 200 individuals that could happily fit on a US. Quarter. 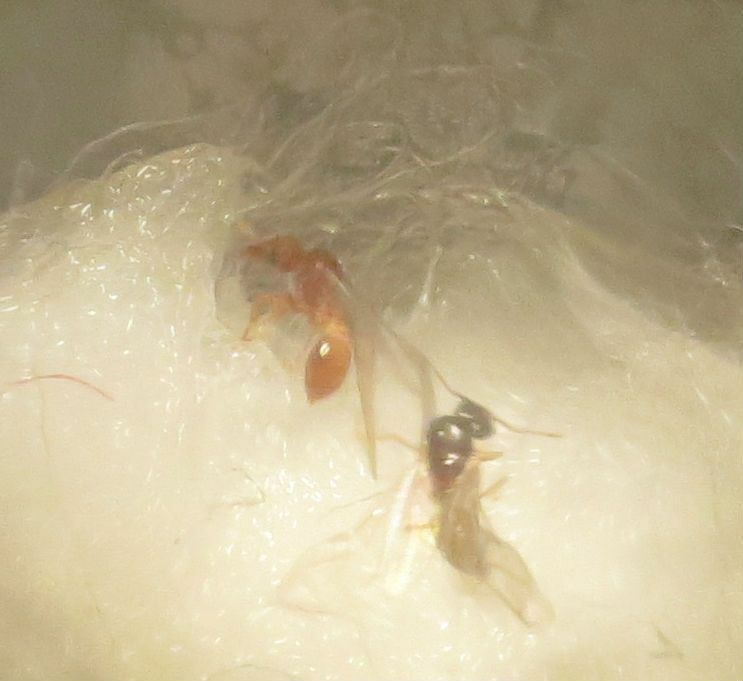 Curiously I discovered these ants hold nuptial flights in the day time but under specific conditions. Here in New Jersey it's the calm before the storm as Hurricane Joaquin moves up the coast. The sky has been solid grey clouds for as far as the eye can see for a few days now, and raining has been off and on. It's been cool out too, around 55F but on the day that it was still 77F I happen to find a few alates to this genus landing on my car. Ants being attracted to bodies of water, parking lots full of cars, and other reflective surfaces isn't anything new, but the fact that this genus flies in the day time is! Everything about their nesting habits has been cold and shaded, and it's entirely possible to accidentally kill them if they get too much sun. So I find it odd that they wouldn't hold nuptial flights at night. Regrettable I couldn't locate a colony sending alates into the air. Their colonies are just too hard to find. But I was successful in catching a queen and male. 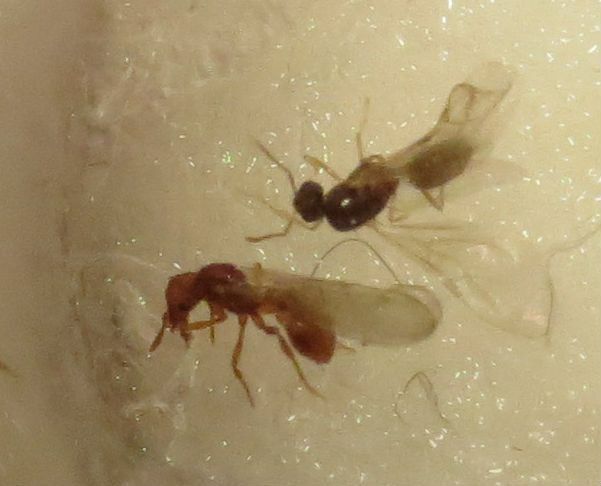 I've no idea if she managed to mate or not (leaning towards no) and it's rare for ants to mate in captivity, especially after being collected. All the same, I'll give her a shot and see if she's able to produce any workers. If not then I'll have to store her in alcohol and eventually pin her for my collection.